Hammond the Missing Talon Tank?? Hero 28 Update!! - miso! With the upcoming changes to the Lunar Colony map, the Overwatch community has been buzzing about the added hints to Hammond. Will he be the 28th hero? All signs at this moment point to yes, and here’s why. We saw this with Doomfist and Orisa. Prior to both of their releases, the Numbani map underwent a small yet significant change, building the lore for their upcoming arrivals. These map tweaks are still in the attacker’s spawn room, where Doomfist punched an OR-15 into the wall, busting the terminal monitor. One of the Lunar Colony changes is an unlocked room next to Winston’s. Labeled “specimen 8”, the room reveals a small broken containment unit. On the floor blue prints and prototypes can be seen for an escape pod. 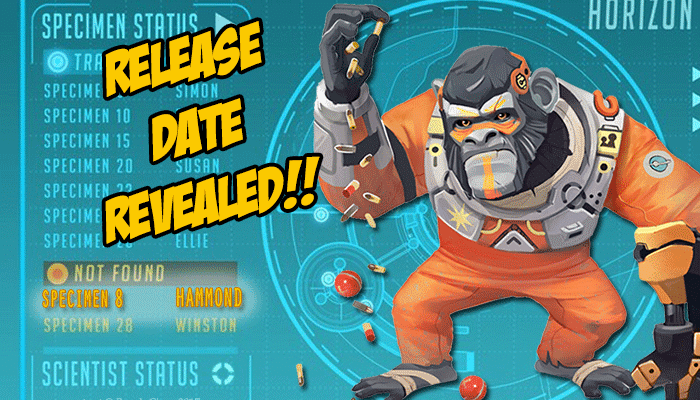 In addition, within the second attack spawn room, Dr.Winston’s space suit is missing. Fans have been theorizing that Hammond stole the suit so he could survive the space trip. 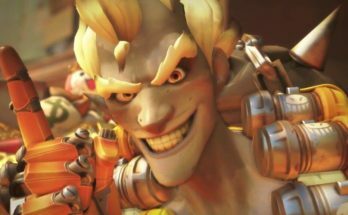 The Overwatch development team follows a strict schedule of hero releases. Characters are released during the months of March, July, and November. Usually between the 12th and 21st of each respective month. 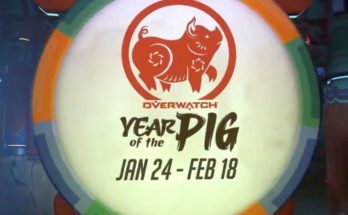 With the release of Brigitte in March, this has confirmed the pattern (as Orisa was released in the same month last year). 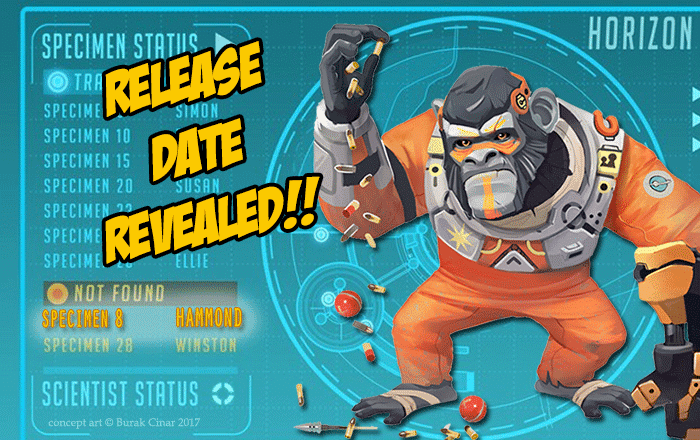 Since we are seeing the same setup that was done for Orisa and Doomfist’s reveals, we can pinpoint Hammond’s release date to be July 27th. Is Hammond a Talon Tank? Fans have been hoping for a new tank. Specifically one of the Talon variety. If you’ve heard Moira call Winston a “jumped up ape”, then you probably don’t buy it. However, just cause Moira has a distaste for monkeys (sorry, I mean “scientists”) that doesn’t mean the rest of Talon feels the same way. But could Hammond be Talon’s missing tank? From the evidence, it’s more likely than you think. When it comes to hero releases, the development team enjoys sneaking easter eggs long before they debut. Moira was teased in lore months before her release, appearing in a panel of the Masquerade comic. Once her origin’s video was released, a new easter egg was teased. In the boardroom scene, there is an image of a suit in the upper right corner on the bulletin. 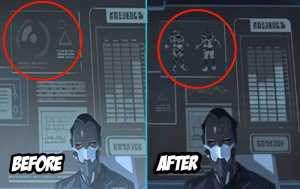 To add to the mystery, the suit design was edited in post Moira’s release. On closer inspection, the suit share some similarities with Winston’s armor. Design looks to feature heavy shoulder pads and a protruding chest plate (not to mention something on the back that could be small jet packs). In total there are 18 heroes, 5 villains, and 4 characters in the awkward middle ( i.e. Junkrat, Roadhog, Symmetra, and Hanzo). 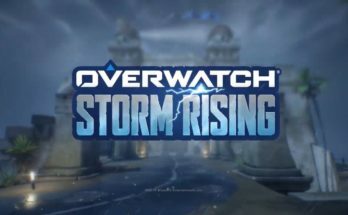 Jeff Kaplan has alluded that in the near feature the characters will be forced to “pick a side”. Even if all the “neutral” characters submit to the dark side, team Talon will still be outnumbered 2:1. With Hammond being the next Talon operative, it helps to balance the playing field. Plus, the new category arrangement shows a deep need for more tanks to be added to the game. The move to make Hammond a Talon tank would hit two birds with one stone. Have your own theories about Hammond. Do you think someone else will become the missing Talon Tank? Share with us your thoughts in the comments below and subscribe to us on Patreon. Curious about what else you can look forward to in Year 3? Click here to find out! Next Article Jump Force E3 Showcase: the Anime Fighter of Your Dreams?